Scroll down to view all available condos for sale and for lease. The Four Seasons is a high rise that offers 64 residential condos located on floors 21-25. 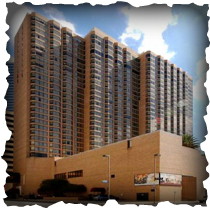 This downtown high rise building is only three and half blocks from the metro rail. Amenities include: 24/7 Valet Parking | Town Car Service to downtown destinations | Private Entrance and Elevators - separate from Hotel | 24/7 Lobby Attendant | Choice of newspaper delivered daily | Fitness Center | Pool | Dry Sauna | Evening Shoeshine | 24/7 Business Center Access | Housekeeping. Also available for a fee- 24/7 In-Room Dining | Spa Services | On-Site Laundry and Dry Cleaning.